Globacom is a modern company in the mobile communications market in Nigeria, which has been recognized as the second national operator in the country since 2002. Today its services are used by over 5.2 million subscribers and its market coverage is about 25%. The operator is primarily focused on providing services that meet the needs of today's users, so it has created Smart packages that combine two best features to make calls at low rates and use the mobile Internet. This is one of the reasons that these packages are gaining more and more popularity among users. The terminator, who decided to place hybertone GoIP in Nigeria, is interested in cheap prepaid packages. The operator offers a series of tariff plans prepaid Join Glo 8. It includes packages N100 Gives, N200 Gives, N500 Gives, N1000 Gives, and N5000 Gives. Another line of the prepaid package includes Glo Generation G. The cheapest tariff plan is N100 Gives. One minute of conversation will cost as little as $ 0.010. At the same time, you should top up in the amount of a $0.32, with the subscriber to get bonuses in the amount of $2.71. Similar conditions apply to Glo Generation G. By paying $0.32 the client receives a 50% bonus. As a result, the account is top up for $0.48. One minute will cost $0.010. 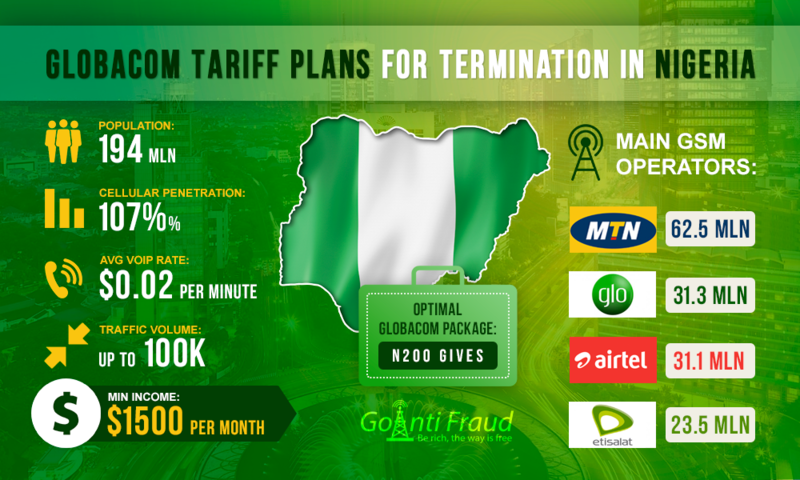 Terminators can successfully use the other two tariff plans - N200 Gives of Join Glo 8 and N200 of Glo Generation G. Cost of one minute of conversation will be identical to the previous package. However, in the second case, the operator also provides a 100% bonus for new subscribers. Accordingly, one minute of a local call will cost $0.005. However, the terminator has to consider that a prerequisite for connecting VoIP SIM Nigeria is making calls only within the Globacom network in Nigeria. To activate the numbers, you need to dial a combination of numbers: *170*5#. By the way, the termination market in Nigeria is now being actively developed. Transit operators are willing to buy routs to terminate mobile traffic from Globacom at $0.0197 per minute. Thus, the profit per minute will amount to about $0.0097. Terminating for 6-8 hours within 6 days, you can make about $1,000 from a single channel. When installing a GoIP 32 port GSM gateway, your profit is multiplied by the number of ports.